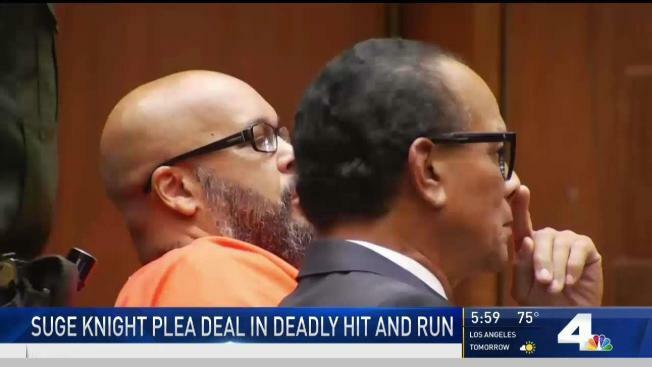 Days before his long-awaited trial was set to begin, former rap mogul Marion "Suge" Knight pleaded no contest Thursday to a voluntary manslaughter charge for running over a man with a pickup truck in the parking lot of a Compton hamburger stand. Knight is facing a 28-year state prison term when he is sentenced in a downtown Los Angeles courtroom Oct. 4 by Superior Court Judge Ronald S. Coen. Along with the voluntary manslaughter charge, Knight admitted an allegation that he used a deadly weapon -- a truck -- when he ran down 55-year- old Terry Carter in the parking lot of Tam's Burgers in the 1200 block of West Rosecrans Avenue on Jan. 29, 2015. Knight, now 53, also struck and injured Cle "Bone" Sloan, who recovered after being seriously injured, authorities said. The fatal confrontation, which was captured on dramatic surveillance video, occurred near a filming set for a promotional video for the movie "Straight Outta Compton," the origin story of the rap group N.W.A. Knight had claimed he was trying to flee the scene in his truck, contending that Sloan -- who was working security for the film set -- was armed with a gun. Jury selection had been scheduled to begin Monday in Knight's trial on charges of murder, attempted murder and hit-and-run. He was facing a potential life prison term if convicted as charged. Knight, who was brought into the courtroom Thursday in orange jail clothes, agreed to give up his right to a jury trial as part of the plea deal. Charges against Knight are expected to be dismissed in a pair of other pending cases: an alleged robbery involving the theft of; and alleged criminal threats against F. Gary Gray, the director of "Straight Outta Compton," in August 2014. Knight, a Compton native and former football player, co-founded Death Row Records, which in its heyday in the early 1990s was generating revenues of about $100 million per year. He helped launch some of rap's biggest acts, including Dr. Dre, Snoop Dogg and Tupac Shakur. He was with Shakur the night he was gunned down in 1996. Knight served five years in prison for assault and federal weapons violations and, after his release in 2001, spent another 10 months behind bars for violating parole by hitting a Hollywood nightclub valet. In August 2014, he was shot a half-dozen times at a Los Angeles-area nightclub.